Ecuador’s capital might seem on first sight like just another big South American city, however, this one has quite some attractions. To start with, it is scenically surrounded by volcanoes like the famous Cotopaxi and also some other, more harmless but still beautiful mountains. Furthermore it has a picturesque old town area through which we strolled admiringly, exploring the various plazas, colonial buildings and markets. We furthermore climbed the frighteningly steep steps of Quito’s Cathedral to get a first bird’s eye overlook of the city. Despite that this was already impressive, we went on to conquer the 4050m high Cruz Loma to get an even more impressive view as our reward. For the more relaxed and injured, it is possible to take the cable car, the active ones can hike up. On the top, everyone meets again and there are some more smaller hiking trails to follow in order to see the city and its surroundings from all angles. 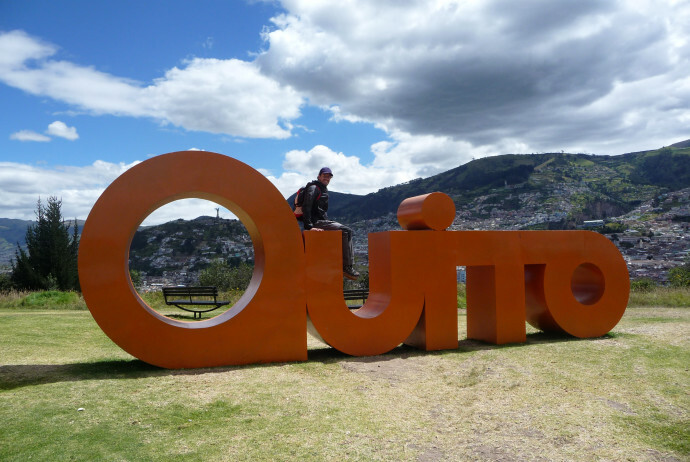 Quito’s most famous sights, however, are its monuments of the Ecuator line. Yes, it’s not only one, but two. The main monument was built between 1979 and 1982, however, soon it became clear that the calculations were not entirely correct and that the real Ecuator line was 240m farther to the north. Thus, a second landmark had to be build. Visitors nowadays have a choice which Ecuator line they prefer to visit. 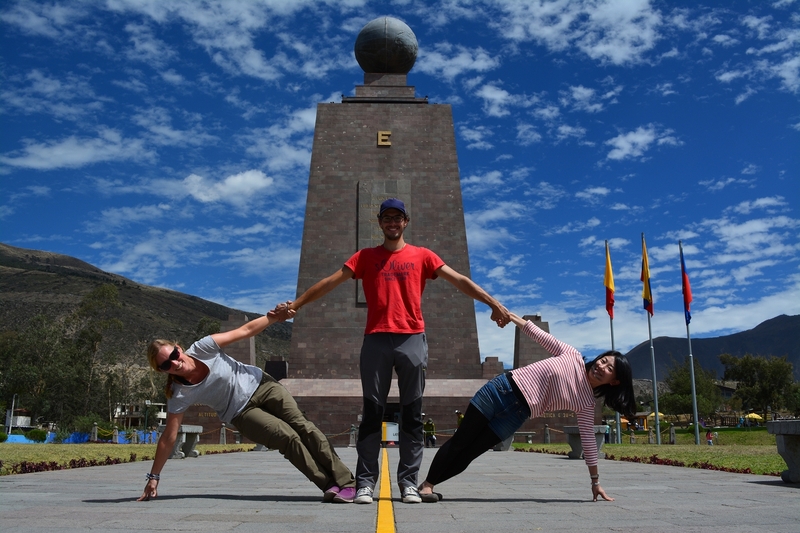 We decided to visit the original Mitad del Mundo monument and will keep the second one for our next visit. The Ecuator is a special place and being there offers the opportunity to conduct some unique experiments. For instance, at latitude 0 (and as close as we were to it too) water flows without vortex, it is supposedly easier to build things due to increased balance and one weights less while there. Only 3 hours by bus away from Quito is the famous market city of Otavalo. This place is a must for everyone who wants to see Ecuador’s biggest market and even more so for backpackers who still have room for souvenirs in their backpacks. We did not have any more empty space in ours, however, we still went. Thus, as we could not stop our shopping frenzy, we in the end had to buy an extra duffel bag each to store our “loot”. When we left for our next destination, with the new bags as well as our big and our small backpacks loaded up, we felt more like mules than backpackers. 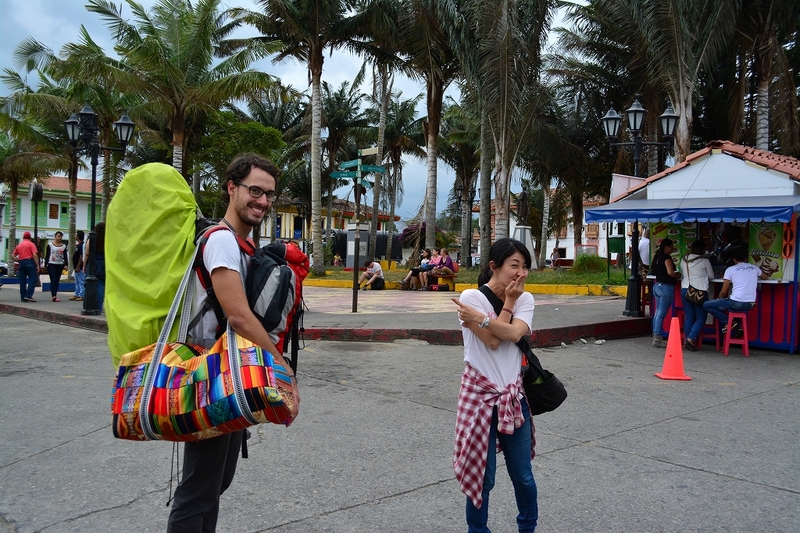 Nevertheless, we carried all our extra pounds with dignity and embarked on our journey with destination Colombia. Where to sleep: If you are looking for an accommodation with a good location, friendly staff and affordable rates, the hostel Chicago could be an option. If you are tired of being all the time in cheap hostels, we have a great deal for you in Otavalo. Hostal Curiñan is more of a hotel rather than a hostel, and while the prices are still quite reasonable, the value for money is amazing. And a bit of luxury once in a while can boost every backpackers mood, or at least ours. Where to eat & drink: Sushi Shibumi – a tasty sushi bar in Quito. In Otavalo, La Cosecha Coffee offers delicious coffee which helps you recharge your energy during a long shopping day on the markets. What to do: Hike Cruz Loma for the best view over Quito, not only from the top, but already all along the way up. Also: visit the market in Otavalo, if possible on a Saturday. For us it was one of the best places to buy souvenirs we have found so far in South America.